With just two weeks away from baby time, I've finally found a prenatal vitamin that doesn't upset my stomach and is easy to take -- Premama a flavorless, prenatal vitamin drink mix. Just mix it with your favorite flavored beverage, yogurt, or oatmeal. No more horse pills or prescriptions needed. At least I'll still be taking a prenatal vitamin post maternity when breastfeeding too. 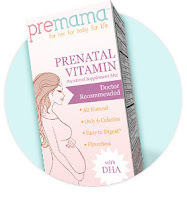 Like a traditional pill, Premama, has all the key prenatal vitamins and minerals needed during pregnancy—including folic acid, iron, DHA, CoQ10 and calcium. Premama’s ingredients have also been shown to help relieve common prenatal vitamin side-effects, such as nausea (due to added ginger root powder) and constipation. Best of all, it's all natural! You can order online and soon purchase at Whole Foods. For more information go to www.drinkpremama.com and www.facebook.com/drinkpremama. Disclaimer: I received free product for review and compensation as part of a promotional program with Premama and MomSelect. oh my goodness only two weeks away!! How are you feeling? I heard you have to continue to take prenatals for a few months after the baby is born. Is that true? Hi Trina! yes, you should continue taking prenatal vitamins for a few months, especially if you're breastfeeding. I also know friends that always take them instead of a general multi-vitamin.